Few cities hold onto their negative past (on purpose) as well as Salem. The witch trials of old bear many a harsh reminder (such as how frenzied fear can cause people to kill their neighbors), yet aside from the power of learning, the power of tourism holds even larger sway. It is to this that I owe my several visits to the town. This last trip, I had more on my agenda then the local history, as a local coffee establishment called Jaho Coffee & Tea had captured my attention with rumors of good coffee. 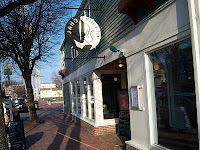 After taking in some of the puritanical sights, we made our way to the old maritime wharf where the coffeehouse rests. The cafe is a multi-leveled shop with an array of seating and a lounge-like atmosphere. Of Jaho's coffees (they roast their own), I tried their Rwandan via drip. A medium roast, it sampled saucy, sweet, with a bit of ginger and a noticeable stale/cardboard quality (pretty obvious to be from an old pot). The espresso, prepared short and with a good head of crema, displayed bright and bitter contrasts up front, a little chocolate, some salt, sugar and a tinge of five spice. The espresso seemed prepared fairly well and the espresso blend decent (though both seemed like they had more potential then how it showed up in my cup). The tea is Mighty Leaf. In wrapping up my experience, I found Jaho to be at least a fair coffee presence and at best, not well represented that day. Yet another place to wait to revisit for a more definitive ruling. If you're in town (hopefully not for a trial), try the brew at Jaho. I'm a huge fan of good coffee...I'll have to check it out next time I'm in MA. I don't know if you ever need to purchase interesting coffee mugs wholesale... If you do, you really should check out Splendids. They have uniquely shaped coffee mugs that are reasonably priced.